The two topics that received her undivided attention and enthusiasm were grandchildren and traditional recipes. Mrs. Saradha Rajamani, a 75-year-old Tamilian lady from Salem is a mother of 3, grandmother of 4, and great-grandmother of 2. By her own confession, she indulges the children and is a ‘yes’ person with them in every regard. She also loves taking care of guests with home-cooked meals, and is happy to share her culinary prowess with them. A perfect epitome of a ‘content homemaker’, she is never ever bored and finds enough things at home to remain happily occupied. Having heard much about the family’s love for animals and helpful nature, I met up with them at their residence in Salem. Namaste Saradhaji. Can we start with your childhood? Saradha: I was born in Mahadhanapuram, a small town near Tiruchy District in Tamilnadu. I grew up over there and was married at the age of sixteen. I then moved to Mallur town in Salem district. From 1964, I have been living in Salem with my family. Since you were married when you were quite young, who taught you cooking? Radhika (daughter): I would say that while my mother is an expert in all the snacks and sweets such as murukku, ompodi, laddu, and badam halwa, my grandmother was very good with the day-to-day cooking. Grandma was influential in passing on her proprietary poriccha kootu, karunaikizhangu masiyal and rasavaangi to Amma. However, Amma’s specialty dishes are tomato thokku, vatthal kuzhambu and milagu kuzhambu – the taste is incomparable. It would be fantastic to document all these recipes. Saradhaji, was food a way to your husband’s heart? Saradha: I am sure that is always the case. I will share with you the recipe for another sweet dish today. My husband, Late Prof. Rajamani, was a very friendly and hospitable person. He enjoyed conversing with friends and strangers alike. He was a professor who turned into a businessman with the refractory business. I have heard much from your family friend Veena Gurubatham, who introduced us, about your husband’s love for animals. Saradha: My husband was indeed a great animal lover and even though he is no more, we still have cows, calves, dogs and cats in our backyard. We have had domestic animals for more than five decades now. That must be a lot of commitment and work as well. Saradha: Yes, it is. Luckily we have a big house and a large backyard. So space is not a problem. We have staff who help with the animals. When I wake up in the morning, I make tea for all the workers, and then I prepare porridge for the dogs. We give them vegetarian food. That’s interesting. Can you share the recipe for the doggie porridge please? Saradha: With pleasure. You will need 1 kg wheat, 500 gms ragi, and 100 gms each of soya, green gram, sago and roasted gram (pottukadalai). Dry roast all of these and grind into a powder. This can be stored for weeks. Every morning, I cook a cup of this powder into porridge-like consistency and add some milk to it. I also add some multivitamin drops and calcium tablets. This is a nutritious and wholesome diet for our dogs. 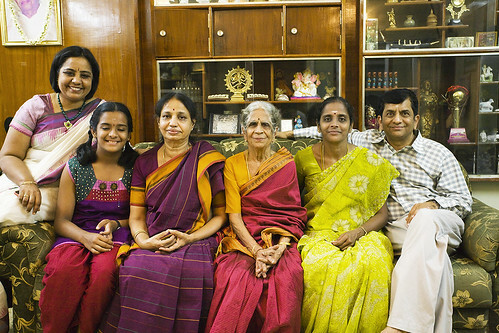 Radhika (daughter): Amma truly enjoys taking care of her second family in the back yard. Despite her fragile physique, she very punctiliously wakes up before dawn to tend to them! The cows have developed such a bond with her that she knows exactly what they are going through. It extends to the two German Shepherds in the house. She has limited her physical chores around them due to age, but that has not affected their relationship. For me, it is an experience watching them in the wee hours of the morning! I definitely believe my love for animals is from her DNA. How do you manage all of this? Are you very strict? Saradha: I don’t think I am strict at all. In fact, all of them tell me I am too liberal with the grandchildren. Ranjani (daughter-in-law): I think she is very adjusting. My own friends enjoy coming home and conversing with her. She is very good at making guests feel at home. Veena (family friend): I think it is truly commendable how they take care of their cows and dogs. As a family, they are very helpful. They reach out to people who need help and are non-judgmental in their relationships. Sekhar (son): Another passion for Amma is her agricultural produce. Feeling extremely proud of her harvest, she loves sorting and distributing them among the workers and local shelters. She is extremely content and at total peace doing charity work at her own level. Your energy is truly amazing. And I am enjoying the way your children are such great fans of yours! Radhika (daughter): I would say that her world is very small extending from the ‘kolam’ in the front yard to the cowshed in the backyard. Nonetheless, she has seen life in all aspects, morphing from a shy bride to being the pillar behind dad’s success as a brilliant entrepreneur. What I like about Amma is her capacity to breeze through many difficult situations in life. She not only raised three children of her own but accommodated six more from her sisters-in-law! To top it, there is a fleet of factory/farm/office staff that she has to feed and take care. It is a sheer madhouse each day. She is a tough cookie, inside out! First published in Dec 2013 in Harmony – the Indian magazine for silvers for the column – The Great Granny Diaries. Part-2 of this post is Paal Kozhukattai, an authentic Tamilian recipe from the kitchen of Saradha Rajamani. She is the 16th grandma featured in this column.